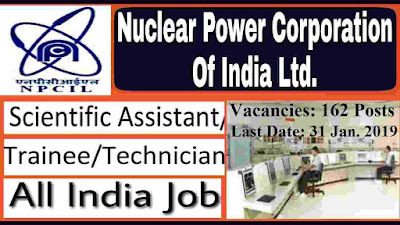 NPCIL is also known as “ Nuclear Power Corporation India Limited” is, a leading public sector company under the Department of Atomic Energy, Govt. of India. NPCIL having complete ability in all facets of nuclear technology namely, Site Selection, Design, Construction, Commissioning, Operation, Maintenance, Renovation, Modernization & Up-gradation, Plant Life extension, Waste Management and Decommissioning of Nuclear Reactors in India. We found an official notification on to the official website of NPCIL department in which they published the latest Notification related to the new Government job opportunities. We share the whole information in this article from that official notification only. So all the rights of the information which we shared in this article goes to that PDF file which we also shared under IMPORTANT LINK section at the last of this article. NPCIL Recruitment department issued an official Notification to recruit for Scientific Assistant and Trainee posts. There are total 162 vacant job profiles which are going to be filled up through this NPCIL Recruitment 2019. Online Government jobs applications are invited ONLINE for theses posts to share these challenging spectrum of responsibilities. 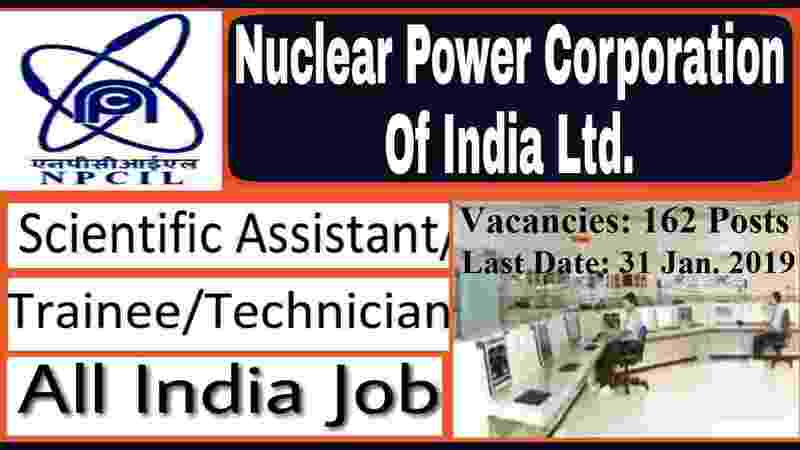 More information related to these Government jobs in India under NPCIL Recruitment 2019 is given below in this article. So read the full article very carefully before applying for this NPCIL Recruitment 2019. Educational Requirement: Those who have completed their Diploma in Engineering can apply for these job profiles. Age Bond: Must have age in between 18 years to 25 years. Education: Only those can apply who have completed their Graduation in Science stream only that means BSc pass candidates can apply. Education– Diploma Holders in Civil Engineering can apply. Age Bond: Must have age in between 18 years to 30 years. Education: Those who have a certificate as a Plant Operator or diploma as a Plant operator can apply. Age Bond: Must have age in between 18 years to 24 years. Education: Must have ITI certificate can apply.